Rockland Window Coverings—located in Spring Valley, New York (NY)—are your most trusted source for custom roller shades from Hunter Douglas to Spring Valley, NY and the surrounding area, including Pomona, NY and Saddle River, New Jersey (NJ). We also proudly carry the full selection of Hunter Douglas window treatments. Hunter Douglas Roller Shades are a classic window treatment option that will provide you with function paired with a modern and crisp flair. Distinctly designed and available in 4 different styles, Roller Shades are versatile and easy to incorporate in almost any room of the home. Designer Roller Shades are an improved and updated classic roller shade. Minimalist, clean, and incredibly versatile, Designer Roller Shades are available in more than 300 fabrics and are customizable in almost every way. You choose the colors, patterns, textures, opacity levels, and top and bottom treatments for a perfectly designed roller shade that fits seamlessly into your existing décor. Featuring simple operation systems that are time tested and reliable, Designer Roller Shades perfectly combine function and style. Sonnette® Cellular Roller Shades are unlike any roller shades you’ve seen before. 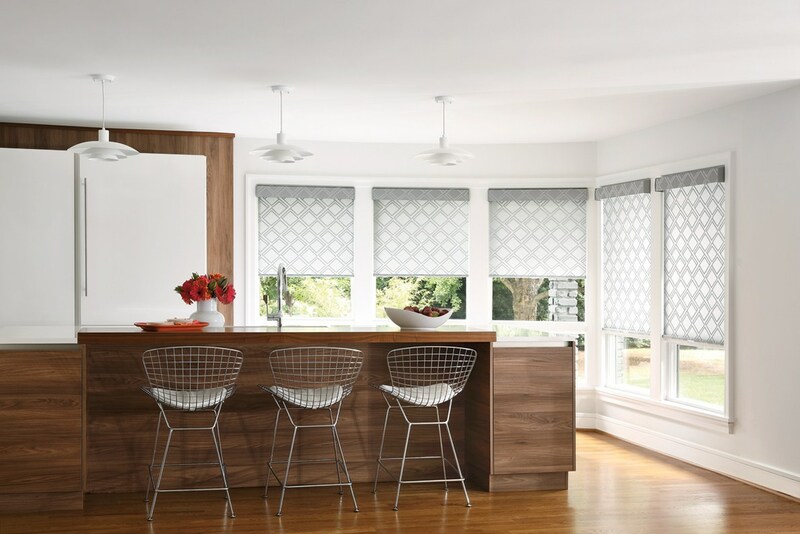 These roller shades, crafted with the same design of Hunter Douglas’ energy efficient cellular shades, provide your home with eye-catching texture and modern lines. The innovative design and construction provide your home with gentle light diffusion for natural sunlight throughout your entire home. Because these shades are available in a wide range of fabric colors, multiple textures, different opacity choices, and multiple operation system options, you can customize these shades to meet all the function and design needs of your home and decor. Designer Screen Shades are ideal if you appreciate the beauty of natural light but want protection from the sun. Designed with unsurpassed UV protection, these screen shades will block your home and family from these surprisingly harmful rays. In addition to protecting your family, screen shades will help protect floors, artwork, and other furnishings in your home that are also easily damaged by UV rays. Designer Screen Shades are an excellent choice for those who want an unobstructed view through their windows. Let the beauty and natural lighting of the outdoors surround you while keeping yourself protected. Available in a stunning range of colors and opacities that you can custom design for your exact wants, Designer Screen Shades will add crisp, modern function and style to your home or even your patio. Designer Banded Shades are completely unique. Pairing sheer and opaque fabric in an alternating banded pattern, these shades create an intriguing and elegant display. Not only unique in appearance, these shades operate smoothly for excellent light control and diffusion throughout your home. Designer Banded Shades are available in many bold colors, different band sizes, and two striking geometric designs allowing you to customize the look of your windows even more. If you are ready to introduce the modern simplicity of roller shades into your home, contact the window treatment experts at Rockland Window Covering today. Proudly serving Spring Valley, New York and the surrounding areas, including Pomona, New York and Saddle River, New Jersey, our team of trained professionals can help you choose the perfect window treatment to make your windows and home shine.